Dec 9 - AME Matsuri: Festive at 6! Xeven:Thvrsday performed their single, "Pieces of Yesterday," as closing for the Saturday Night Live show on RJTV. Also, if someone can record the performance, please upload and post a link for those who will not be able to watch. Thanks! Also, the November 4 Sei no Matsuri Tomasinotaku event has been moved to November 11, 2006. From all accounts, it will still be held at VILLA RONAR, Marikina Heights, Marikina City. December 9, 2006 - AME Matsuri: Festive at 6! 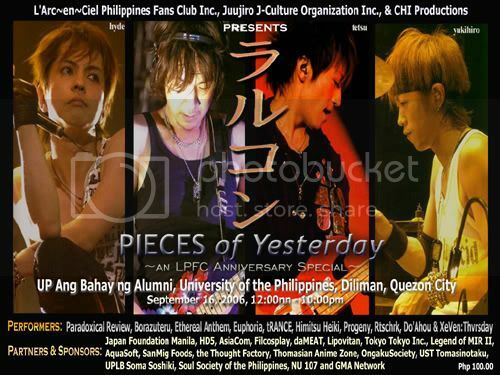 They will be available at the L'Arc~CON which will be held today, September 16, 2006 at the UP Ang Bahay ng Alumni. Pieces of Yesterday will be given away to the first 50 people to come in. The Devil Within and Ambivalence will be sold at PhP50 each during the event. If you are not able to secure a copy, contact us through these numbers if you wish to order: +63917-2513029 or +63919-5203174. Please indicate the number of copies of the single/s you wish to purchase. Prices remain at PhP50 each. However, this service will be available to Metro Manila residents (with the possible exception of neighboring provinces) for the meantime, as transactions will have to be handled personally.